This is the (C) edition. This is the (A) edition. I currently have the two Lutheran Study Bibles in my personal library. I am attempting to look at both of these reference books to perhaps understand some of the theological differences between the two most common Lutheran traditions. 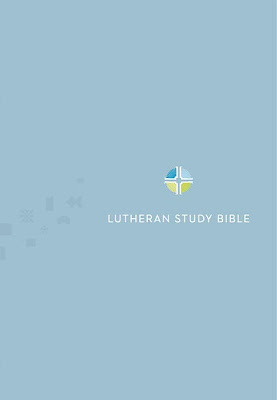 The Lutheran Study Bible is published by Concordia Publishing House and I refer to this work as (C). 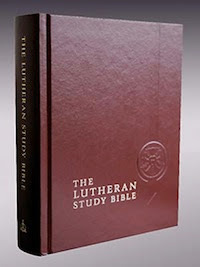 Lutheran Study Bible is published by Augsburg and I refer to this work as (A). I come from the conservative Lutheran tradition, the (C) if you will, but many of my friends and family are in the other tradition. I want to learn more about the Bible, too, as I admit, as most Lutherans would, that I haven't been reading my Bible as much as I should. I am quickly learning that there are several areas of inquiry in which I am deficient. I do not know much of anything about the history of exegesis, that is how the reading and interpreting of Biblical texts has been handled through the years. It is important for me to know about this so that I can recognize some of the assumptions which guide the editors of the two study Bibles under consideration. I also don't know very much about the Old Testament. I am not going to recommend the (A) over the (C) or the (C) over the (A). If anyone should ask which edition of the study Bible she should buy, I would answer 'Yes.' By all means buy one of them. If a study bible helps one get into the Word, then buy it.